Consumer interest in natural and organic products is translating into some colorful innovations. When expanding their line of teas into "-ades," product developers at Honest Tea Beverage Co. (www.honesttea.com), Bethesda, Md., wanted the color to reflect the natural state of the product. "We wanted to create a lower-sugar, USDA-certified-organic thirst quencher, similar to the Honest Tea line, but without the tea," says Samme Menke, the company's public relations manager. "We strive to provide a number of different options for our consumers, ranging in the types of fruit notes they can come to expect, as well as types of beverages." The resulting Honest Ade line of six beverages is as colorful as it is flavorful. And it all comes naturally … although not without careful selection of the color additives. "The spectrum of natural colors available to us is limited, and since our products are organic certified, our toolbox is even smaller," says Mike Petrone, Honest Tea's product development manager. But he also points out another advantage to using natural colorants: the nutrient content. Switching to natural not only builds a positive label through what isn't there, but also what is. "Anthocyanins found in our purple, red and pink beverages contain natural antioxidants. And beta-carotene provides vitamin A and a nice orange-yellow color. To our label-reading customers, seeing that the coloring is coming from a fruit or a vegetable carries a lot of weight, especially in the wake of negative press around artificial colors." What Does Natural Mean When it Comes to Colors? The FDA defines two types of color additives: those exempt from certification (which can include those so-called "natural") and those subject to certification (typically "synthetic" or "artificial"). However, there's a big hitch when it comes to labeling: If you color your food with a substance that's not an inherit component of that food, you can't label it "natural." For example, purple carrot juice isn't naturally found in elderberries, so it's considered an artificial coloring when added to elderberry juice. You can, however, include it on the label just as it is, i.e. "Blackberries, elderberries, purple carrot juice (for color)." In the push to meet consumer demands for more organic and natural choices, true success is in such details. "Consumers are increasingly educated and loyal to products with clean labels and easily understood ingredient lists," says Tom Tsimboukis, marketing director for Milwaukee-based Sensient Technologies (www.sensient-tech.com). "They want cleaner, more wholesome ingredients in products." The naturalness that makes botanically derived colorants more attractive, however, also presents technical challenges. "Natural colors require constant innovation to improve their vibrancy and stability," he continues. "Part of this innovation lies in developing more stable botanical sources, identifying new sources and even developing new plant hybrids." "Clearer emulsions, improved stability, use of natural antioxidants and encapsulation technologies -- all have advanced in some respect due to stronger consumer demand for natural and organic products," says Campbell Barnum, vice president of branding and market development for D.D. Williamson (www.ddwilliamson.com), Louisville, Ky. "In the past year, more U.S. companies have researched or trialed natural coloring options, partially in response to the European Union's de-facto ban on synthetic color additives." It wasn't an outright ban, but the 2010 requirement that six synthetic food color additives--Alurra Red (also called Red 40), Ponceau 4R, Tartrazine (Yellow 5), Sunset Yellow FCF/Orange Yellow S (Yellow6), Quinoline Yellow and Carmoisine--carry the warning: "[this color] may have an adverse effect on activity and attention in children." The FDA considered similar labeling in hearings earlier this year but did not find enough evidence to recommend a warning. Compared to synthetic food colors or artificial food colors, naturally derived food colors are usually more sensitive to heat, light, oxygen, pH and metals (all from processing, storage/packaging and distribution impact). These cause oxidation leading to fading, browning and flavor changes. Take pH. Anthocyanins generally are red in acid and shift toward purple as pH (alkalinity) increases. "In terms of carotenoids, some forms of annatto will precipitate in acid, while beta-carotene is stable at low pH," explains Barnum. "The hue and stability of some carmine/cochineal forms also vary according to pH. Calcium and iron are two common metals that adversely effect color stability. And vitamin C (ascorbate) demonstrates either a positive or negative impact on color stability. For example, it increases the stability of carotenoids, whereas it degrades anthocyanins." Color scientists have been able to meet a lot of these challenges by continuous improvement on colorant technology. "New applications resulting from advances in natural color spectrum expansion include a myriad of clean-label beverages and children's dairy products, including yogurt, ice cream and novelties. In the U.S., perhaps the fastest-growing new product sector for natural coloring formulation is candy and confectionery, especially in the past year," says Barnum. "The basic raw materials for natural colors are mostly fixed through a combination of legislative requirements and economic necessities," says Andrew Kendrick, international technical development manager for LycoRed (www.lycored.com), Orange, N.J. "Although the demand for natural colors is across the spectrum of food and beverage types, it's foods consumed by children and young adults where we see the major natural color breakthroughs to displace synthetic colors, specifically in confectionary, soft drinks and dairy products." Another key innovation from LycoRed was the development of the "New Generation" formulations. Their color expression has been increased, which delivers a substantial cost-in-use improvement. "As the consumer desire for naturally colored products continues to grow, innovations have come in the form of application for specific formulations," adds Kendrick. "The benefit to the food manufacturer being that the cost barrier in moving from synthetic to natural colors has been significantly decreased." Ohad Cohen, CEO of Vitiva (www.vitiva.eu), Cannes , France, points to several areas in natural colors that demand innovation. "There is a push to find new sources of pigments to replace green copper chlorophylls, carmine and synthetic blue," he says. "Organic food is growing a lot in Scandinavian countries, Germany and Switzerland, but the demand for organic colors is so low, the constraints are so high and the stability so low that there is no color producer who is pushing in this direction. There's a need for food manufacturers to adapt their processes and distribution channels due to shorter shelf life. 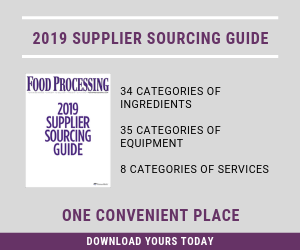 This forces color manufacturers and food processors to have a technical exchange from product launching throughout the manufacturing chain and to the shelves." What goes on the outside is a key part of that chain. "We focus not only on the source of the color but also on its packaging," says Mark Goldschmidt, Sensient's technical director. "With our new aseptic packaging system, we're able to offer processors preservative-free natural colors with a shelf life comparable to a preserved color. It meets all packaging requirements for clean-label products, plus it aligns with our sustainability policy by reducing waste. It also is completely recyclable, minimizing the carbon footprint and it enables us to meet any manufacturer's custom brand-definition needs." Demand for natural ingredients and clean labels spur new red and blue color solutions.